The Jagahüttn is tucked away in the Rhineland-Palatinate part of the Hunsrück in the romantic Dhrontal, a tributary of the Moselle, not far from the wine villages Trittenheim and Neumagen-Dhron and in a sublime position above the picturesque village Gräfendhron, the former widow seat of the Counts of Hunolstein. Formerly built as a massive hunting lodge and fully refurbished to modern standards in 2018, today it offers a quaint setting for relaxing days surrounded by nature. The guest has a magnificent view of the wooded slopes of the Dhrontal and enjoys the tranquility and amenities of a secluded location right on the edge of the forest. An intimate hideaway for undisturbed togetherness or even for up to 4 people, it offers an ideal starting point for hikes and culinary delights in the Mosel-Franconian region. The Jagahüttn offers comfortable and furnished in alpine style living pleasure on 60 square meters for up to 4 people. 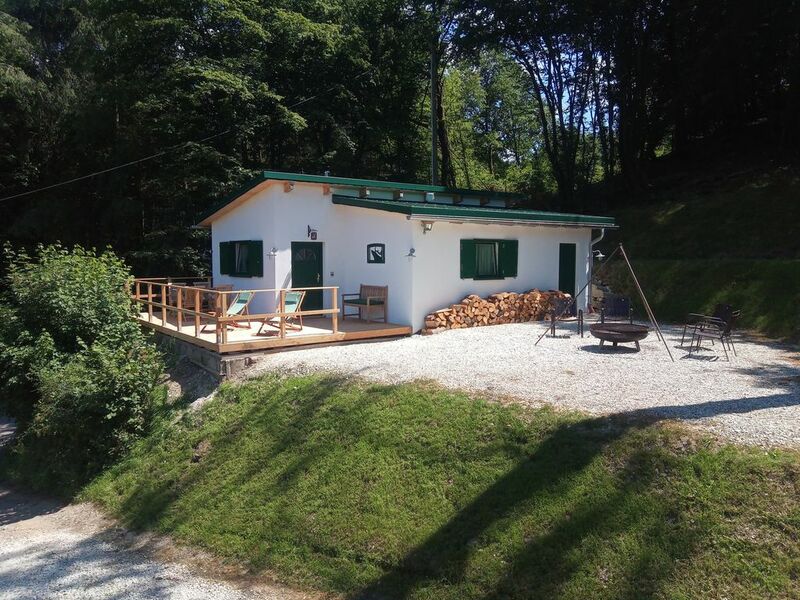 A real hunting lodge, which still serves today as a starting point for hunting trips into the surrounding forests and was completely renovated in 2018. It consists of a living room with stove and sitting area, which opens onto the spacious kitchen. Separate are the bathroom with shower, bath and toilet and the double bedroom and the Schalfboden. In front of the Jagahüttn - and the building partially circulating - a 25 square meter terrace offers fabulous views of the Dhrontal. The equipment is high quality, but rustically nostalgic and includes woodburning stove and underfloor heating, satellite TV, stereo, microwave, coffee machine, dishwasher, convection oven with ceramic hob. The rustic Wohnstubn is the largest room of the Jagahüttn, very bright through several windows and allows the view across the terrace on the surrounding wooded slopes of the romantic Dhrontal. A sitting area invites you to linger. The open rustic solid wood kitchen offers a fridge-freezer, microwave, dishwasher, coffee machine and convection oven with ceramic hob. The kitchen is fully equipped. A stove provides cozy warmth and romantic fire play not only on cold days. The comfortable and cozy bedroom is accessible from the Wohnstubn at ground level and equipped with a large double bed and a 5-door wardrobe. A large window provides a view of the outside area. The cozy sleeping loft is directly above the bathroom and can be reached via a ladder from Wohnstubn. It offers two full beds, but with limited room height. Ideal for children who want to have their own empire, but also suitable for adults. The small but fine bathroom offers everything that makes the heart of both sexes beat faster. A large glass rain shower and toilet and vanity a small bathtub to relax. A small window lets the sunlight play on the wall in the morning. Directly in front of the Jagahüttn offers a 25 square meter terrace a magnificent viewpoint, from which the view over the valley can wander. It invites you to sit, eat, drink, sunbathe and chill out. The evening sun can be enjoyed excellently there. It is fully equipped with seating, dining table, parasol and sun loungers. In front of the Jagahüttn is a sheltered place with a barbecue area. On the wooden swing grill you can prepare delicious local specialties such as wild sausages or steaks of the same name. Bathroom (6 sqm) The small but fine bathroom offers everything that makes the heart of both sexes beat faster. A large glass rain shower and toilet and vanity a small bathtub to relax. A small window lets the sunlight play on the wall in the morning. Urig und trotzdem modern! Tolles Haus in schöner Umgebung! Reibungsloser Kontakt zum Vermieter, super Unterkunft, es fehlt an nichts. Ruhig und abgelegen, aber dennoch ist man schnell an allen interessanten Punkten im Hunsrück, Mosel und darüber hinaus. Gerne wieder! Die Jagahüttn empfiehlt sich für Gäste zwischen 8 und 65 Jahren !